A tranquility of a mountain village makes you free from the din and bustle of the city. There are some relaxation spaces in the property. Enjoy serenity of a mountain village over the singing of birds and insects. We welcome all guests with humble but warm hearts. The reception retains the atmosphere of the traditional front desk of Japanese inn.A big wall clock in the lobby chimes the hours. Take a rest sitting around the table installing a brazier after a bath time. Cool yourself viewing the garden after taking a bath at the station.The pot hanger with images of Ebisu-the God of Shipping and Daikoku-the God of Wealth had been used at the kitchen of Motoyu Ishiya for years. A lovely lamp with a hare pattern will throw light on your heart. he lounge furnishes a wooden mortar as a table, used in Motoyu Ishiya before.You can see the Yakushi-do dedicated to Yakushi-ruriko-nyorai out of the window. We offer the silent space for you to be lost in thought. The statues of Amida-nyorai, Gohyakurakan, and Tamonten made in the Kamakura period are placed in the room. Meditating here over burning incense you will get released from worries. 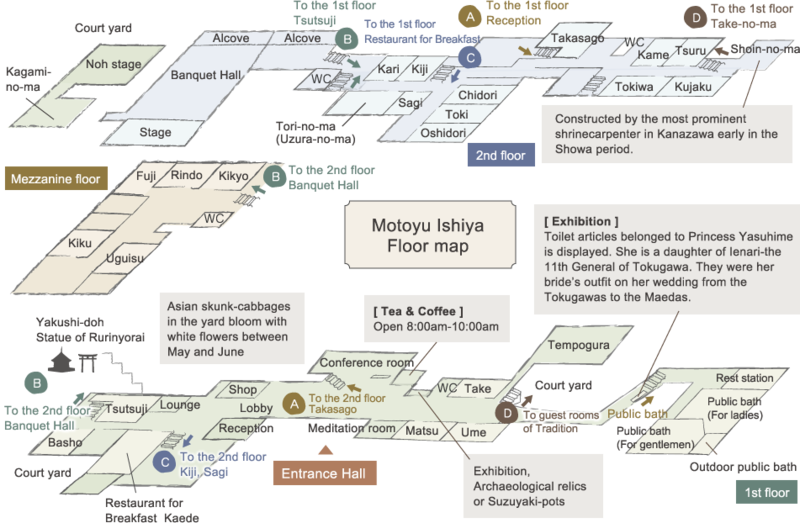 There is the special space where you can see the Noh stage in the second-floor banquet hall. Enjoy a mystic and profound Noh play feeling completely at ease in wide and comfortable seats. The banquet hall is so big to have one hundred tatami mats on the floor installing an inner Noh stage. It can be used for performance of Rakugo-comic storytelling, flute concert, or lectures. The room was named as it is the greenroom installing a big mirror. It was constructed when the stage was built having a history of about one hundred years. There are six private rooms in the restaurant. We have Yakushi-do or a small shrine worshiping for generations in Motoyu Ishiya. Why not take a walk to meet these deities in the fresh morning or before dinner when the sky dyed crimson. Just pray before them, and you will feel your heart content. It is said that the image of Yakushi-ruiriko-nyorai was enshrined by the high priest Gyogi who found the Fukatani hot spring in Nara period. The Buddhist image of mercy is known as a deity of health recover, longevity and hot spring, and has been watching over people visiting here since the hot spring opened. A red small shrine stands looking out over the inn. Hakuashi-inari-daimyojin, a god of good business is enshrined there. The same god is also enshrined in Kanazawa shrine which is known as the place giving a name to Kanazawa city. A steep flight of 68 stone stairs may be self-improvement steps to good business. The image is dedicated the 7th master of Motoyu Ishiya. He was killed when he saved a child from the traffic accident by dump. His intimate friend carved the stone to make the image for him. Sitting silently under the cherry tree the statue has warm atmosphere to welcome all visitors.